Am wondering about some pemmican or other chopped or shredded dried meat; the thing is, processed meat makes me queasy just as a general idea. Dump it all in a crock pot and let it simmer for however long seems right. Stick it in jars. See what happens if I make pies out of it. Don’t use canned anything if you can at all avoid it. Canned vegetables are gorilla phlegm. I’m serious. Directions for the spaetzle can be found here. Drain them and set them aside in a bowl while you do the following, and toss it occasionally to keep them from sticking to each other. Heat up the pork stock in a small saucepan and whisk the 2 Tbsp of flour in it to thicken it up. A good way to do this and not get lumps is to mash up the flour in a teacup with a few tablespoons of stock until you have a smooth paste, then add the paste to the rest of the stock in the saucepan and moosh it up. Get the biggest frying pan you have (no, bigger) with deep sides, and saute the chopped onion in the olive oil on medium heat. When it’s tender, add the mushrooms and saute them. When they’re tender, add the chard, stir the whole thing up, and let it fry for a few minutes. Add the spaetzle. 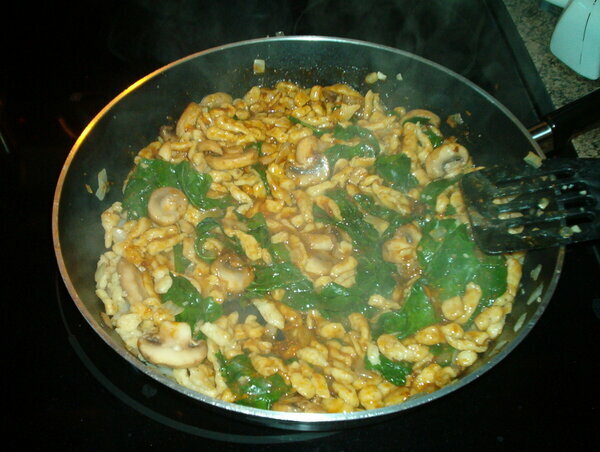 Stir it up so that the spaetzle is on the bottom and covered with the mushrooms and chard; that helps it saute a bit. After about two minutes of idle stirring and sizzling, add the thickened pork stock and stir. Let this heat together for about a minute, stirring. Turn off the heat, dump some into a bowl, and chow down. This also saves and re-heats for lunch again really well. And you could probably stretch meat nicely with it. I might throw in some shredded pork or even, despite the fact that it’s made with pork gravy, a piece of shredded baked chicken breast. I need to dig up my recipe for Nutella ice cream next. That’s definitely a once-a-year recipe, too. Nutella tastes like Beethoven’s 3rd symphony in a jar. Gonna try it this weekend. Check out the “recipe” tag at the right for the spaetzle recipe. Gonna replace an egg with an equivalent amount of honey, replace the spice with cinnamon, then stew some apples, and dump the spaetzle over top with a spoonful of double Devon cream and see how it goes. Will report back this weekend. Recipe forthcoming if it works out. If it does, the next one I try will probably be ginger spaetzle with stewed blueberries and lemon curd. And I mean that “once a year.” Make them more frequently, and you will look like someone who makes them more frequently. And your pancreas will hate you. Minus the oil for frying, moosh it all up together in a bowl, knead it until smooth, wrap it in cling film, and let it sit in the fridge for about 15mins. Start heating the oil on medium. Take out the cool dough ball and cut off a piece about the size of a lemon. Roll it out to the thickness of about a pinky finger, and cut pieces off the end with a sharp knife about the size of a chickpea. Do that to the whole ball of dough, then dump them by batches into the now-hot oil. They will fry up and turn golden in about a minute; they cook fast. Also, you will need to sieve them periodically and poke them with a knife as they cook and make sure they aren’t stuck together. Because they have shredded cheese in them, they can stick together where the cheese has melted on each little ball’s surface. It’s not tragic if they do; you can break them apart easily after they cool. Sieve them out and let them drain/cool on paper towels. Put them in a container, salt to taste (you shouldn’t need any more salt, really), put the lid on the container, and shake. Put them in front of a gang of people and back off, keeping your hands and feet away from their mouths. You may hear a sonic boom. I’ll post a picture once I get my hands on a little card-reader thing to get the pic into the computer. Seriously. These things are GOOD. They’d be awesome tossed into a bowl of chili. BTW, you probably won’t want to reuse the cooking oil, just because these things have pepper flakes in them, which will flavor the oil too noticeably for the next use. I think I have to do this. 1. Mix together flour, salt, white pepper, and nutmeg. Beat eggs well, and add alternately with the milk to the dry ingredients. Mix until smooth. 2. Press dough through spaetzle maker into boiling water or broth. Here’s a video of someone doing it; it’s pretty bombproof. The actual making part starts around 2:25 in. 3. Cook 3 to 4 minutes (at the most). Strain out when they float. Drain well. I have a feeling I’m going to wind up covering them in some fresh cheese and some gravy made from the leftover pork jus from the pork loin I made a while back. Sort of poutine with spaetzle. And with Indian fresh cheese. So sort of an Indian-French-Canadian-German sort of um, thing. It would probably be nice in a cream sauce with some chopped asparagus and scallops, too. Or sauteed in olive oil instead of butter with some onions and collard greens with chopped bacon. And I wonder if there are any sweet recipes? There have to be. I mean, this stuff looks like pancake batter. I should put up the ones I make with eggnog and the Nutella ice cream recipe as well. Those make NICE ice cream sandwiches, too. I used graham crackers broken in half so that they were more square-ish for the Nutella ice cream, and made flat gingerbread cookies of the same shape for the eggnog ice cream. I got these off of a now-dormant recipe site called The Black Oven. They’re incredible. I’ve reposted here because frankly, I don’t know how much longer that dead old site will be around. Cream together butter, sugar, molasses, and honey. Beat in egg yolk and ginger pieces. Sift together flour baking soda, baking powder, salt, and spices. Add dry ingredients to wet ingredients in thirds, and take off any rings first because you’ll have to mix this by hand. The dough will be VERY dry, like play-do that was left out too long; you’ll have to shape the cookies by hand. Bake 8-10 minutes. I use no-stick cookie sheets. Do not over-bake. Let cool completely before you try to move them off the sheet or else they’ll disintegrate. Don’t even go near them until they’re cool. These work well when iced with a thin, white cookie glaze, too. Makes about two dozen for me. If you don’t feel like making fresh cheese, a small container of ricotta is fine. I made paneer (Indian fresh cheese) the night before using this recipe. You can watch a woman named Manjula making it on YouTube, but she makes a larger recipe here. It can help to see it done, though. Boil the milk, stirring frequently to make sure it doesn’t scorch. Just when it comes to a boil, turn the heat off and pour in the lime juice, stirring while you do so. Stir as it curdles, then let it sit until it’s cool enough to not burn your hands. Line a strainer with muslin, and pour the curdled milk into the strainer. Save the liquid runoff (greenish whey) if you want; it can be used to make more paneer in the future if you like. (If you have a lot of it, like it you used a gallon of milk or something, you can also make ricotta with it.) Let it drip a bit, then run some water over the curds to wash the lime flavor off of them so the resulting cheese tastes like cheese and not sour milk. Pull it up into a ball in the muslin and squeeze hard; let it drain and drip in a safe place for two hours or so (I hung it off the faucet and let it drip into the kitchen sink), then take the wrapped bundle of cheese and squash it under a weight for a bit in the fridge. A quart of milk will give you about a cup of cheese. Let it sit in a ziploc overnight in the fridge. Cut it into small cubes, like 1/2″ size, before using. When this is done, add the can of tomatoes, the cashews, and the avocado to the saucepan and mush it all up with a wand blender until it’s a good, smooth consistency. It won’t be perfectly smooth, but pretty good. You’ll have to smoosh the tomatoes individually at first under the bell of the blender — and be careful not to splatter. Simmer the resulting gravy for a bit, maybe five-ten minutes. BTW, cover the pot when you do this ask me how I know. This is a good gravy to have on hand, just a jar of it in the fridge. It is heaven on Earth with gnocchi and great over focaccia as an impromptu pizza, so feel free to make more than you need and just save it in a jar. Bake a decent-sized boneless chicken breast and shred it with a knife and fork. Get some small frozen scallops, not the big ones. Get a 9×13 pan, put some gravy in the bottom, and put 3 noodles along the bottom. Add some gravy, half the shredded chicken, half of the cubed paneer, and … uh, some scallops. Repeat with some more gravy, and the rest of the chicken, scallops, and paneer. Spoon more gravy over this, then another three noodles. Spoon the rest of the gravy over it. Cover with foil. This keeps the top of the lasagne from drying out and turning into inedible leather, so don’t forget to do it. Bake for … an hour? … at 350-375, something like that. This freezes pretty well. Using a spatula, cut it into serving-sized pieces and place them into little containers, then put the containers in the freezer. When you get home at night, boom — pop one into the microwave, and instant dinner. Heat the milk only, and mix the tablespoon of powdery thai tea with it as it’s heating. You don’t need to get it to boil, just get hot. Put it in the fridge and let it cool down completely. Don’t strain the tea out; you don’t need to. Mix everything but the raisins and coconut into a 1.5qt ice cream maker, and turn it on. In the last 5 minutes of processing or so, add the raisins and coconut. You’ll probably have to mix it a bit more by hand when it’s done. Pop into the freezer and enjoy! I wouldn’t use bobas in this since they won’t deal well with being frozen, but raisins make a nice substitute. I need to put the recipe up for the eggnog ice cream I made one time, too. It involved store-bought eggnog, so it was fairly easy, but my brain won’t hold onto anything.